In office blocks all over the country corporate people are digging deep for pregnancy gifts for that colleague about to leave on their maternity break. There will be one poor soul in charge of the collection and that person generally has to come up with several unique baby gifts ideas and go out and source them from the baby shops spread the length and breadth of the high street. Not any more! Having worked in an office and been that designated person we know how difficult it can be to spend the budget wisely and in the allotted time (usually your lunch hour). If you would prefer to order a baby gift and be sent an invoice, please register your details with us first and we'll set up an account for you after we've carried out a few checks. To register, please click here or to request a brochure, please click here. Rock-a-Bye-Baby Gift Boxes have the ideal corporate gift idea. Companies can order the baby gift box or baby basket of their choice by email or phone and we can issue an invoice direct to your HR department. The new baby gifts will then be delivered to the recipients home meaning that she doesn't have to drag it home on the bus or train. Alternatively you can have the new baby gifts delivered to your work so you can all be there when she opens it and reap the compliments. 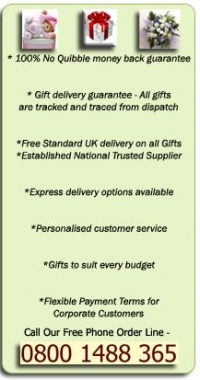 If you need any help or guidance in choosing your newborn baby gift box we are only a phone call or email away and are very happy to assist you in spending your money!